I am the heart of Cape Breton. I have existed for millennia, shaped by ice, water and wind. All of these influences worked together to make me what I am today. All things are connected to each other forming the great circle of life. If close attention is paid to my cycles and rhythms, to my ebbs and flows, you will see that I can provide for now and for the future. If close attention is not paid, I will wither: I will not be able to feed all of you, shelter you, or provide for all creatures that live within me. It is my hope that great attention can be paid to how we can live together in harmony, with respect and full admiration. I cannot do this alone: I am in great need of your assistance. The Guiding Principles offer a moral compass, or theme, which will influence how decisions are made and which actions are to be under taken. These guiding principles ought to live up to the spirit and intent of the Charter, which calls for Understanding, Respect and Cooperation, now and into the future. We must try to understand and respect all components of the Bras d’Or Lakes ecosystem. The health of the Lake must be improved. On-going damages must be stopped, the waters must be cleaned, and once-abundant species must be encouraged to return. Once this is achieved, maintaining the health of the Lakes should be the most important focus. We must understand, respect, and cooperate with the people who interact with the Bras d’Or Lakes, directly and indirectly. For those of us who live in the watershed, any improvements we can make to the system will make us happier and healthier. We must find a balance between a healthy ecosystem and the need for people to provide for their families through the creation of jobs and wealth. 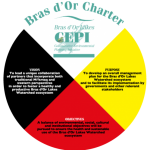 With this in mind, we propose the following principles to guide people’s considerations, decisions, and actions while interacting with the Bras d’Or Lakes and collectively managing her resources. These principles are for all to observe, whether you are a government decision maker, a visitor, or a permanent resident of the watershed. We all have the responsibility to assist the Bras d’Or Lakes in healing. We are part of Nature, not the owners of Her. We acknowledge and respect the trees, the birds, the fish, and all our relations with whom we share the Bras d’Or. We are grateful for their important role in maintaining a balance in our natural world. We will assist in healing previous damages. We will use Traditional Ecological Knowledge combined with the tools of modern science to assist the Lakes in healing former injuries and work to restore fish and shellfish to their former abundance. We will try to restore their habitats when we discover losses or degradations in them. We will consider the impact of our present actions on future generations. We, the current generation, will think and live in a manner that will ensure that inhabitants seven generations into the future will continue to benefit from the Bras d’Or as we have. We will refrain from decisions and actions that would knowingly harm the Bras d’Or. We will work with authorities to ensure that any proposed alteration is thoroughly reviewed, and will only proceed if the ecosystem shall remain the same or benefit from the change. We will cause no net loss of habitat. We will use the best practices available to ensure that, as we benefit from the use of the Lakes’ resources, we can ensure the restoration or creation of habitats to compensate for any damage we may cause to the land, the water, or native species. We shall be patient and work together in a spirit of mutual respect for the social, economic, and spiritual well being of our Bras d’Or friends and neighbours. Our actions will be transparent, we will measure our progress, we understand our responsibilities to the Bras d’Or Lakes and to its people, and we are prepared to be judged by our peers and by future generations for our actions.